Welcome to the Jimmy Johns Menu page! Here we have listed all of Jimmy Johns menu items on 1 easy to browse page, so start salivating! Jimmy Johns prices vary from location to location, due to varying overhead costs, which is why you won’t find the Jimmy Johns menu with prices on JimmyJohns’ own website. The Jimmy Johns menu WITH prices that you find below is therefore an example of a JimmyJohns sandwich menu from a Mid-Western state, and the prices reflect the location. If you visit a JimmyJohns in Downtown Manhattan, then you can be sure that the prices are higher. Anyway, the high quality of the sandwiches remain the same. Jimmy John’s is a sandwich restaurant franchise that was founded by Jimmy John Liautaud in 1983. It has its headquarter in Champaign, Illinois. The JimmyJohn franchise now has 1200 locations in 40 states in America and 95% of the locations are franchise-owned. Jimmy Johns is opening restaurants at a pace of 200 units per year. Liautaud founded Jimmy John’s in 1983 after graduating second to last in his class. His father gave him the choice to join the military, go to college or alternatively to start a business. He chose to start first a Hotdog business, the a JimmyJohns Shop and hasn’t looked back. The first Jimmy John’s sandwich shop was opened in a garage in Charleston, Illinois in 1983. There was no menu and no outdoor advertisement. Its a great story of hard work and a vision paying off in the end. In 1985, Liautaud bought out his father’s interest in the Jimmy Johns business. Full 8 Inches Of Homemade French Bread, Fresh Veggies And The Finest Meats & Cheese. Medium rare shaved roast beef, topped with yummy mayo, lettuce, and tomato. Fresh housemade tuna, mixed with celery, onions, and our tasty sauce, then topped with alfalfa sprouts, cucumber, lettuce, and tomato. Layers of provolone cheese separated by real avocado spread, alfalfa sprouts, sliced cucumber, lettuce, tomato, and mayo. Jimmy John’sMenu: Plain Slims Sandwiches. Any Sub Minus The Veggies And Sauce. These sandwiches Have Twice The Meat or Cheese. Try It On My Fresh Baked Thick Sliced 7 Grain Bread Or the Famous Homemade French Bread! Real genoa salami, italian capicola, smoked ham, and provolone cheese all topped with lettuce, tomato, onion, mayo, and our homemade italian vinaigrette. The same as our #3 totally tuna except this one has a lot more. homemade tuna salad, provolone, sprouts, cucumber, lettuce, & tomato. Jimmy Johns Menu: Side Items. The image can be enlarged. Ok, thats it, the Full delicious Jimmy Johns Menu to get your teeth right into! 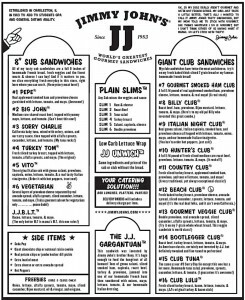 Don’t forget to have a look at our Jimmy Johns Coupons page, for the latest Jimmyjohns deals, including the 1$ sandwich deal. Have a look here: Jimmy Johns Coupons.